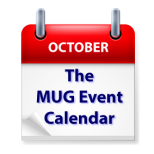 October on The MUG Event Calendar wraps up with at least one appropriately themed meeting. A California creative pro group will look at the art of editing horror movies and clips from the horror film Cut. A Carolina group will look at VPNs and IOS, and a Florida group will talk about, among other scary things, Photoshop Elements. Los Angeles Creative Pro Users Group – Cutting Horror movies, and practical and visual effects, CGI and Sound design in Horror movies. Editor Ed Marx will take us through his workflow and give us tips on what he has learned over the years cutting Horror movies. Also we welcome director David Rountree. who will show us clips from his recent festival favorite and award winning horror film, CUT and discuss the practical and visual FX that went into this movie.